The BrAPP office is open five days a week and peopled by Liz Langley and Sarah Perchard. There will be a friendly voice and if not immediately, by return, advice and information for you all. Liz Langley has worked with BrAPP since 1990. She is Medical Biochemistry graduate with more pharmaceutical industry experience than she cares to enumerate! Working for several leading global pharmaceutical companies in sales, clinical research, new product development and marketing, she became involved with BrAPP to develop their training and education offerings. Since 2014, BrAPP has taken full administration and delivery responsibility for the PostGraduate Course in Pharmaceutical Medicine and Liz facilitates each of the sessions in Cardiff and London. Sarah Perchard joined the BrAPP team in September 2017. Sarah worked with us for several summer vacations while she was at university before becoming a secondary school science teacher– in fact she originally devised the BrAPP database we still use. One of her first roles has been to update and improve it. Her focus is membership services and contact with members. Dana Kidson designs and produces the BrAPP journal PHARMACEUTICAL PHYSICIAN. She has worked with BrAPP since 2004. Peter Fleming has worked with BrAPP since 2014 and is responsible for our website design and security. 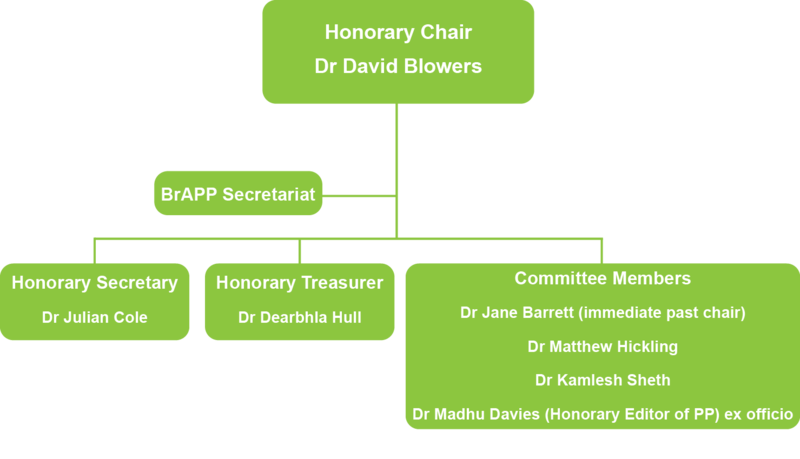 The day-to-day running of BrAPP is the domain of the Secretariat. The honorary committee drawn from the membership convenes to discuss key issues, organise meetings programmes and events. Committee members are ratified at an AGM but enthusiastic members may request co-option at any time during the year.